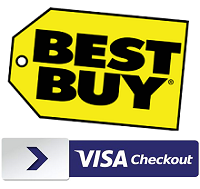 The Best Buy/Visa Checkout deal of last month is back again. Through August 21, or while supplies last, you can get $10 off your purchase of $100 or more from BestBuy.com when you pay using Visa Checkout. In addition, Newegg is also offering a discount of $15 off when you purchase $200 or more, use promo code VCOGOLD16 and pay with Visa Checkout. That deal is also good through August 21 or while supplies last. Through August 18, 2016 or while supplies last, when you buy a Starbucks eGift Card of at least $10, you’ll get a bonus $5 added to your card when you pay using Visa Checkout. For example, if you spend $10, you’ll get a $15 electronic gift card. This offer is valid for the first 200,000 customers between August 4 and August 18, 2016. Limit one bonus per person. Through July 20, 2016 or while supplies last, you can get $10 off your purchase of $100 or more at Best Buy online when you use Visa Checkout to pay. Discount is not available on gift and prepaid card purchases, services purchased and/or taxes paid. Limit 1 offer per customer. The discount will be automatically applied to your qualifying purchase of $100 or more when you select Visa Checkout as your payment method. For terms, see www.bestbuy.com/visacheckout. Note that this offer can be combined with the ongoing Amex Offer for Best Buy, which gives a one-time $25 statement credit when you spend $250 or more either in-store or online by September 5, 2016. This means that if you add your Amex as a payment option to your Visa Checkout account and pay with the Amex through Visa Checkout, you can make $265 in purchases for $230 after applying both promotions. 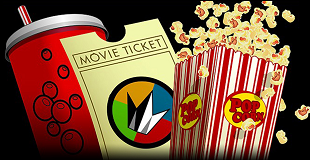 Through July 2, 2016, or while supplies last, you can get a $10 Regal Entertainment Group eGift card when you spend at least $20 in a single transaction with your registered Visa credit card at a Regal Entertainment Group theatre location. Regal Entertainment Group theatres include Regal Cinemas, Edwards Theatres and United Artists Theatres. Through September 30, 2016 or while supplies last, you can earn 500 bonus MileagePlus miles when you enroll your United MileagePlus Visa Card with a new Visa Checkout account and spend $5 or more within 15 days. Well, the Costco transition from American Express to Visa has taken longer than expected, and as a result, Chase Freedom cardmembers would have only had between June 20 and June 30 to take advantage of the 5% bonus at Costco. Through June 15, 2016, PNC credit or debit cardholders can get a $10 statement credit for trying out Visa Checkout. Launched by Visa nearly two years ago, Visa Checkout is an online check out service similar to PayPal. It can be accessed using any web-enabled mobile device, and can store any major credit or debit card–not just Visa cards–so that consumers don’t have to re-enter billing and shipping information. 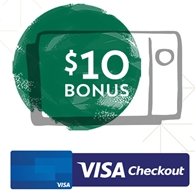 For a limited time, when you buy a Starbucks eGift Card of at least $10, you’ll get an additional $10 in credit when you pay with Visa Checkout. For example, if you spend $10, you’ll get a $20 gift card. Or you can spend $20 to get a $30 gift card. This offer is valid for the first 325,000 customers between May 3 and May 17, 2016. Limit one bonus per person. Need to get organized? Visit Staples.com and for a limited-time, you can save on the products you need to de-clutter your home or office when you pay with Visa Checkout. Through April 9 or while supplies last, you can get $25 off your purchase of $100 or more online at Staples.com when you use Visa Checkout. Discount is limited to one per customer and restrictions apply.